"AS AMERICAN AS MOM AND APPLE PIE," PERFORMATIVE INSTALLATIONART CAR MUSEUM 2008, PHOTO COURTESY OF BERT LONG. FRAMED PHOTOGRAPHED PERFORMANCE IMAGES, HOME MADE APPLE PIES WITH MILITARY EQUIPMENT STENCILED PIE CRUSTS, TRAYS WITH PIE TASTE SERVINGS, UTENSILS, NAPKINS, APPLES, APRON, STENCILS OF MILITARY EQUIPMENT, BOUQUET OF DAISIES IN A PITCHER WITH WATER, DIMENSIONS: VARIABLE,: 6'W X 6'L X 8'H. "As American As Mom And Apple Pie," performative installation, Art Car Museum, 2008, Photo courtesy of Bert Long. 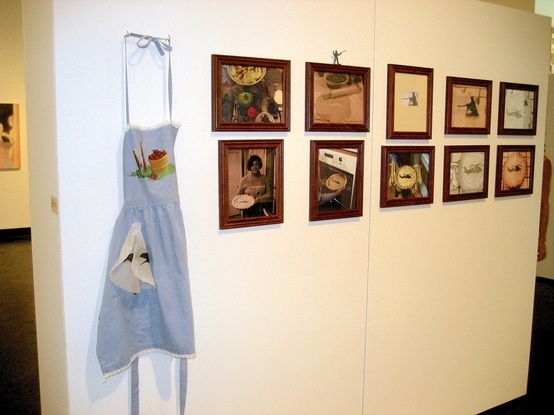 "As American As Mom And Apple Pie," performative installation, The Lawndale Art and Performance Center, 2007. APPLE PIE PERFORMANCE: THE ARTIST, STANDS IN FRONT OF THE PERFORMATIVE, FRAMED, PHOTO-ESSAY-INSTALLATION, PROFFERING HUNDREDS OF INDIVIDUAL APPLE PIE TASTES (FROM OVER 25 HOMEMADE APPLE PIES OF WHICH, EACH CRUST BEARS HAND STENCILED, CUT-OUT IMAGES OF U.S. MILITARY EQUIPMENT, I.E. APACHE HELICOPTERS, F-14 PLANES, TANKS AND NUCLEAR BOMB MUSHROOM CLOUDS,) TO GALLERY VISITORS WHILE ENGAGING THEM IN CONVERSATION ABOUT THEIR PERCEPTIONS AND OPINIONS CONCERNING THE WORK AND ITS' POTENTIAL IMPLICATIONS. As American As Mom and Apple Pie, 2007 and 2008, performance at The Big Show, Lawndale Art Center. Photo courtesy of Bill Olive, Houston Chronicle.